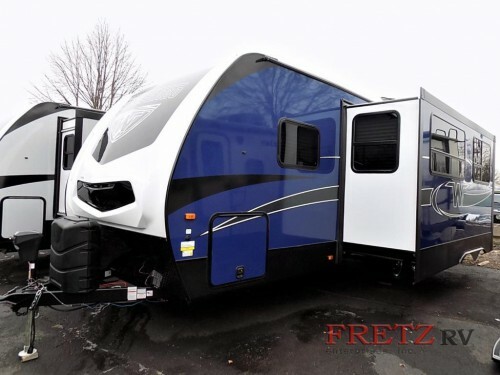 Get ready for fun and comfort when you take a look at the Winnebago Towables Minnie Plus 27BHSS travel trailers for sale here at Fretz RV. From the unique exterior with its bright colors to the modern, beautiful interior decor, everything about this RV gives your family the best of both worlds. Take a look in this Winnebago Towables Minnie Plus 27BHSS review! Check out our Winnebago Towables Minnie Plus 27BHSS Travel Trailers! Taking a family trip to the campground will be easy with the Minnie Plus 27BHSS, and this is due largely to the number of beds available. 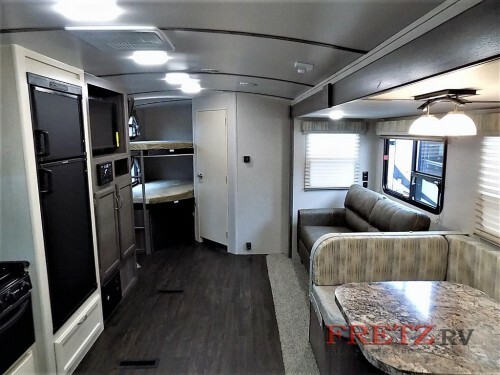 With a private queen master bed, a convertible sofa and dinette table in the slideout, and a set of double bunk beds, you can easily sleep up to ten people in this spacious RV! So whether you have a large family or your kids like to bring along friends, you’ll be certain to fit everybody. Bunk beds and a slideout provide a spacious interior for the whole family. The spacious interior allows you to bring along everything you need for comfort at the campground. Make mealtime a breeze with the full interior kitchen complete with 3-burner range, refrigerator, double sink, and more. 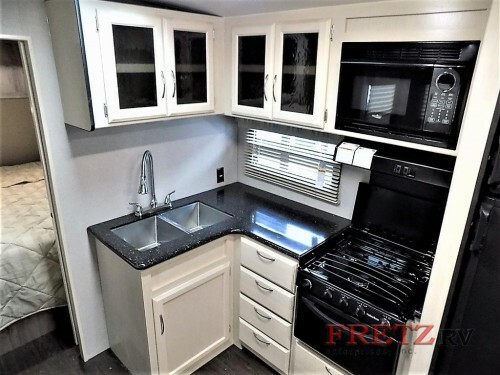 Plus with an extra pull-out kitchenette outside, you can enjoy a cold drink or snack without having to walk all the way inside the camper, and with the 2-burner range, you can fry bacon and eggs outside for the perfect camping breakfast and more. Make mealtime simpler with the interior exterior kitchen. Another at-home comfort you can enjoy with this Winnebago Towable is the full bathroom. With a corner shower, storage cabinet for linens, and more, everything you need will be right at your fingertips. This will add to the convenience of having children at your campsite, because you can skip the walks to the campground bathhouse and enjoy more relaxation time. As you can see, there are so many things about our gorgeous Winnebago Towables Minnie Plus 27BHSS travel trailers that are sure to make your next trip to the campground better than ever. So contact us today for more information on our special internet pricings, and then come on by our location and take a look for yourself to see all that you can enjoy!